Monopoly stands out for his unconventional graffiti style that is colorful, happy and positive rather than a gritty, underground representation in a part of the art world associated with crime and vandalism. His depictions of the Monopoly Man, Scrooge Duck, and Richie Rich transform these characters into 21st century icons who love the good life. Alec Monopoly” is the alias of an unidentified graffiti artist, originally from New York City. The artist primarily works with street art in the urban environments of New York, Los Angeles, and London using varied materials (including stencils, spray paint, epoxies, varnishes and newspapers) to subversively depict the mascot of the board game, Monopoly. Monopoly and his work have been covered by The Huffington Post, the Wooster Collective, Juxtapoz magazine, Complex magazine, The Dirt Floor and commissioned by Paramount Pictures and Kiehl’s to name a few. “Alec Monopoly” is the alias of an unidentified graffiti artist, originally from New York City. The artist primarily works with street art in the urban environments of New York, Los Angeles, and London using varied materials (including stencils, spray paint, epoxies, varnishes and newspapers) to subversively depict the mascot of the board game, Monopoly. Alec Monopoly and his work have been covered by The Huffington Post, the Wooster Collective, Juxtapoz magazine, Complex magazine, The Dirt Floor and commissioned by Paramount Pictures and Kiehl’s to name a few. 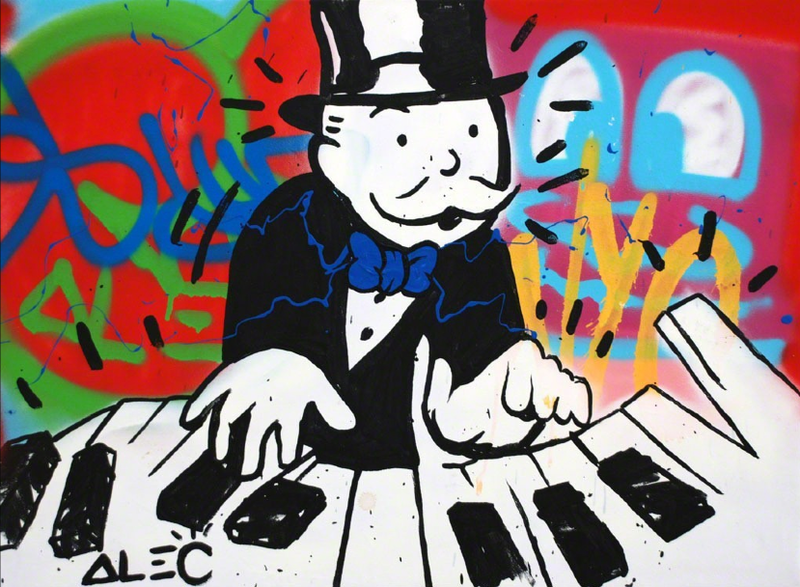 Street artist Alec Monopoly takes his name from the transaction-based board game in which players buy and sell property, accumulate money, and try to make their opponents go broke. The artist employs the character of Rich “Uncle” Pennybags, the game’s suited mascot, to deliver his critique of capitalist greed. In Alec Monopoly’s tableaux, done on city surfaces or on newsprint and framed, the mustachioed character sprints with a moneybag under one arm, laments the lack of universal health care, and gets beaten by a policeman with a bully club. Alec Monopoly uses a cartoonish style to comment on real-world problems, delivering a simplified and exaggerated message nonetheless justified in its decrial of a broken economic system. The first real figure Alec Monopoly painted was Bernie Madoff, whom he considers the ultimate symbol of financial collapse. He also uses cartoon characters Scrooge McDuck and Richie Rich in his work. Alec Monopoly has been exhibited from 2012 at Guy Hepner galleries in New York, Los Angeles and Miami, and for events including the Armory Fair, Frieze Art Fair and Art Basel Miami Beach.